This 3 bdrm, 2.5 bath, two story home has alot to offer, the Master Suite is on the main level along with the Great Rm, Kit, dining and laundry. The Master Suite is roomy as well as the Great Rm. The Kitchen is big with center island. There is easy flow of traffic from the Great Rm, Kitchen and dining areas with the laundry room handy to the Kitchen. The garage is on the main level with easy access to the Kitchen for easy unloading of groceries. 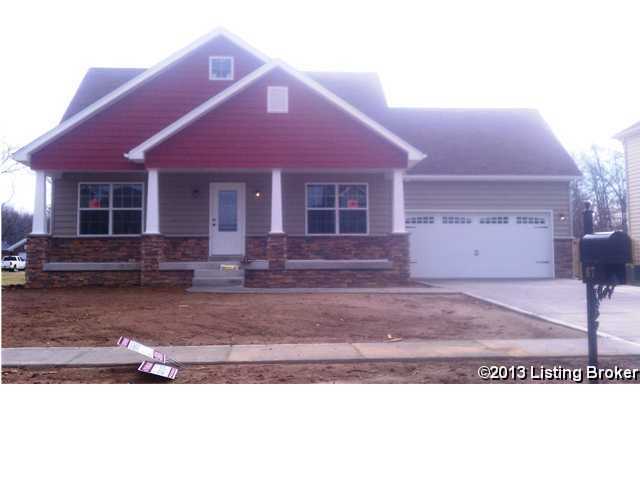 Upstairs are 2 nice size bdrms and hall bath plus unfinished bonus room with 300 sg.ft. Must See!!! This community is part of the Mallard Lake community and will share in the future amenities, pool and lakeside park. Direction: I-65 to exit 117. West on Hwy 44. Right on Buckman St/Hwy 61/Preston. Past US Post Office. Left into Mallard Lake. Left into Reserves of Mallard Lake. 672 Reserves Blvd, Shepherdsville KY 40165 is a Home, with 3 bedrooms which is recently sold, it has 1,475 sqft, 0 sized lot, and 2 Car Garage parking. A comparable Home, has 3 bedrooms and 2.5 baths, it was built in and is located at 119 Boulders West Dr Shepherdsville KY 40165 and for sale by its owner at $ 184,900. This home is located in the city of Shepherdsville , in zip code 40165, this Bullitt County Home, it is in the BOULDERS OF MALLARD LAKE Subdivision, and HEBRON ESTATES are nearby neighborhoods.